1. Strong : مضبوط - توانا : (adjective) having strength or power greater than average or expected. 2. Strong, Impregnable, Inviolable, Secure, Unassailable, Unattackable : ناقابل تسخیر - محفوظ : immune to attack; incapable of being tampered with. Invulnerable - immune to attack; impregnable. 3. Strong, Solid, Substantial : معیاری - مضبوط : of good quality and condition; solidly built. Sound - in good condition; free from defect or damage or decay. 4. Strong, Firm : مضبوط : strong and sure. Gave a strong pull on the rope. Strong Belief : راسخ عقیدہ : an unshakable belief in something without need for proof or evidence. Strizostedion Vitreum Glaucum : مختلف قسم کی پائی جانے والی بڑی جھیلیں اور تالاب : variety inhabiting the Great Lakes. How this page explains Strong ? It helps you understand the word Strong with comprehensive detail, no other web page in our knowledge can explain Strong better than this page. 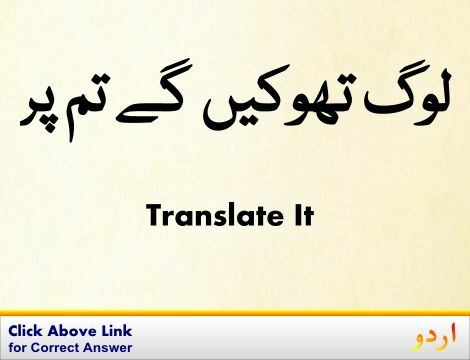 The page not only provides Urdu meaning of Strong but also gives extensive definition in English language. The definition of Strong is followed by practically usable example sentences which allow you to construct you own sentences based on it. You can also find multiple synonyms or similar words on the right of Strong. All of this may seem less if you are unable to learn exact pronunciation of Strong, so we have embedded mp3 recording of native Englishman, simply click on speaker icon and listen how English speaking people pronounce Strong. We hope this page has helped you understand Strong in detail, if you find any mistake on this page, please keep in mind that no human being can be perfect.